Hire us because we advertise and reach people! 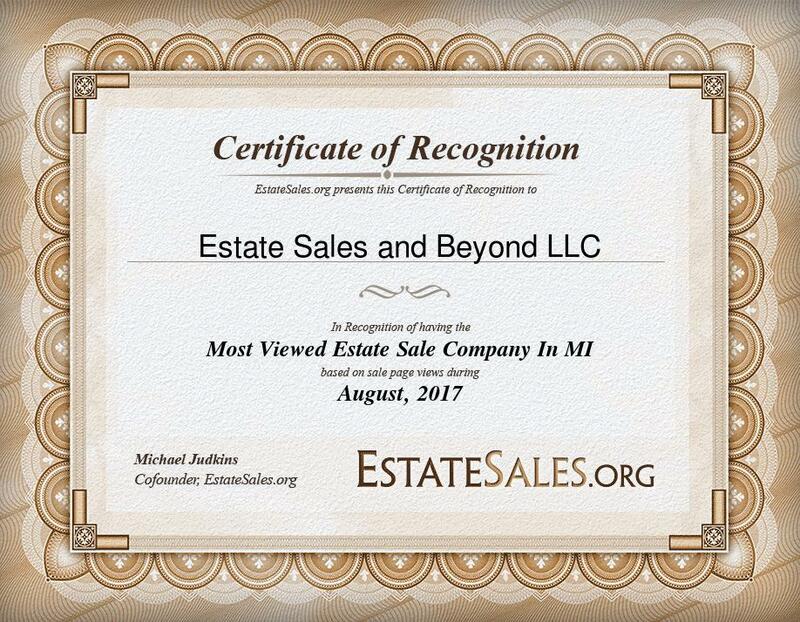 We were the #1 most viewed Michigan Estate Sale Company on Estatesales.org for August 2017. Having over 25 years in the estate liquidation business, we know all the ins and outs of the business. We know what works to insure that you, our client, receive the highest possible revenue from your estate sale or business liquidation. Since we offer a large range of services, you can rest assured of a successful outcome. Listed below is a list of our services currently available. 1) Traditional Estate Sale or Business liquidation. From A to Z we cover it all. We display all merchandise in an aesthetically pleasing manner. We use nice tables with table coverings, professional style price tags, high end cash registers, etc.. We also dress professionally. After the sale, our cleanup is second to none. We do not leave a mess. We also market your sale in many different ways. We utilize all forms of social media. We make a video diary of the sale and take 100's of photos, We also inventory every item over $20.00. And best of all, select items left over after the initial sale can be consigned to continue the sale. Call for more info to see what we can do for you! 2) Online estate or business liquidation sale: Can't have a traditional sale? Whether you have a condo, live in a gated community, mobile home park, high rise, have no parking available or have an inconvenient location...there are times when an estate sale simply won't work. We can host your estate sale or business liquidation by having an online estate sale. This is not an auction. Your items are priced, photographed and placed online for immediate sale. There is no waiting for an auction to end. In this scenario, items are purchased directly from the website with a credit card. We have certain scheduled days for customer pickup. Items can also be moved offsite if need be. Call for complete details. This service is extremely popular. 3) Estate sale consulting and appraisal service: Do you want to be involved and host your own estate sale? We offer Estate and business liquidation consulting. We will let you use our tables and cash register. We help with the pricing of your sale and help with the organizing, We advertise your sale utilizing our many outlets, and even provide the signs. This is an affordable alternative for anybody. It is one flat fee. This is a highly desirable service. We work with you so you can host your own sale, but still have all the benefits of a professional Estate sale. Better call now. Utilize this incredible service today. 4) Consignments: Another very popular service we offer is consignments of partial or full estates. This service is perfect for clients who have a small amount of items, collections of items, a house or business that cannot have a sale or when estate or business items need to be moved and/or sold quickly. You will receive a complete inventory of all items consigned, and maybe best of all, you can follow your items online. We pack, move and sell the merchandise for you. We have nationwide buyers looking for many items. We never use a 3rd party vendor. We sell all consignments directly on our website, utilizing all of our many advertising techniques. Call for the many details of this service. 5) Buyouts: Another popular service we offer is we will simply buyout your entire estate or business liquidation for a fair price. This is an important service when time is of the essence. We will negotiate a price with you. Once a price is agreed upon, we will pack, load and move all items in a timely manner. We will never leave a mess behind. Dumpster rental service is available for clean outs as well. This is also a one stop service. Call for the many details of this service. If ever you have a question on any of our popular services, we are only a phone call away. We are a professional Estate and Business liquidation company. With over 25 years experience in the industry we are proud to serve the mid-west. We are based in Oakland County, Michigan. Our primary service area is focused on the communities in Southern Michigan (especially Oakland, Macomb, Washtenaw, Livingston, counties) but we can extend far beyond our home base when necessary. See the list below of locations of recent sales. Being knowledgeable in every aspect of the liquidation business is key. We offer many different services to insure our customer the highest possible revenues. Whether the Estate items are located in a condo complex, a high rise, gated community or any location that makes it difficult or impossible to have a "regular" estate sale, call us. We have several options available and never do we use a third party vendor.